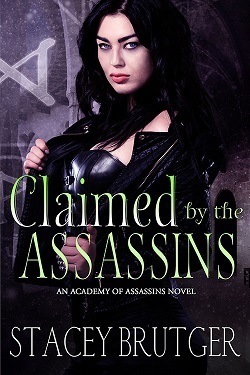 Which means I’m going to try and release Queen of the Assassins : Book 4 later this year. Woot!
" Genius! Thank you!!! " Lol...I hope you enjoy book two. I have to admit, I had a blast writing all the mythological characters, including Morgan and her Assass Gwen wrote: ""
Lol...I hope you enjoy book two. I have to admit, I had a blast writing all the mythological characters, including Morgan and her Assassins. :) ...more "
"Heartrenchingly beautiful- what a gorgeous story. My first book by Adriana Locke and it certainly won’t be my last! Loved Crew Gentry! " We’d love your help. Let us know what’s wrong with this preview of Sacrifice by Adriana Locke. Goddammit, i need the next book." We’d love your help. Let us know what’s wrong with this preview of Hoax by C.L. Stone. Stacey Brutger made a comment on Happy New Year….
" Margo ❀ wrote: "happy new year!! Have a great Margo ❀ wrote: "happy new year!! Have a great wonderful year!" I am shooting for (1) a second Academy book, (2) Electric Curse - book six in the Raven/Electric Series, then (3) either a third Academy book or a brand new book/series. *fingers crossed that all goes as planned* :) ...more "
What should our May 2017 Alt be?